I bought an Audiotrak Prodigy Cube Black from eBay authorized seller gyrocom on June 21th 2018 and paid through PayPal , and I've been using it ever since fOr gaming with a headphone plugged in with the V-Moda BoomPro microphone using their two-connector cable (one in for mic, other out for headphones). This setup has worked flawlessly for a couple of months until about a month ago, where the microphone input started doing crazy things. For once, people stopped hearing my voice, and instead they hear themselves being echoed/reverberated endlessly with a strong hiss that amplifies over time. I hear that too, because the headphones out still work, but nothing can fix the Line in. I'm using the Prodigy Cube Black on Windows 10 64bit. I've checked cables, I've rebooted, trying to unplug the Prodigy and plug it back, I've also made sure the microphone isn't faulty by plugging it to the regular microphone in on my computer. Nothing works... Since the Prodigy doesn't need drivers, I couldn't try reinstalling them, but I tried reinstalling my audio (Realtek) drivers, and it doesn't work either. The only thing I haven't done is to open the Prodigy and check the hardware, because I wanted to contact you before just to make sure I don't void my warranty... Can you help me out with this issue please? Look at the picture on the bottom. 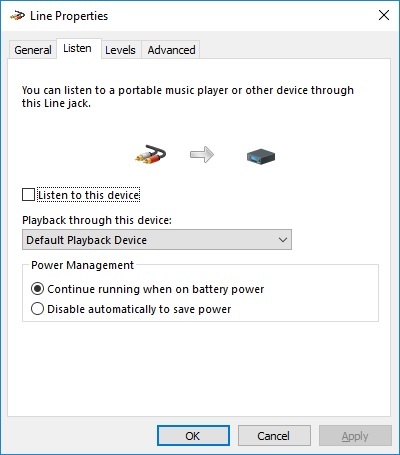 Please don't select the 'Listen to this device'. And then please check it again.